Idaho St. 21 - Air Force 49. Air Force faced off against the mighty Bengals of Idaho State last week and trounced them in typical Air Force fashion: 484 yards rushing on 58 attempts (8.3 YPC!!!). Running back Cody Getz accounted for the brunt of the load (17 carries, 218 yards, 3 TDs) while senior quarterback Connor Dietz did exactly what you expect an option QB to do (8/11 for 142 yards, 7 carries for 74 yards and 1 TD). In total, 11 different players carried the ball at least once for Air Force. #8 Michigan 14 - #2 Alabama 41. Game recap. You know what happened here. Michigan came up against the closest thing to a juggernaut that college football will see this season. 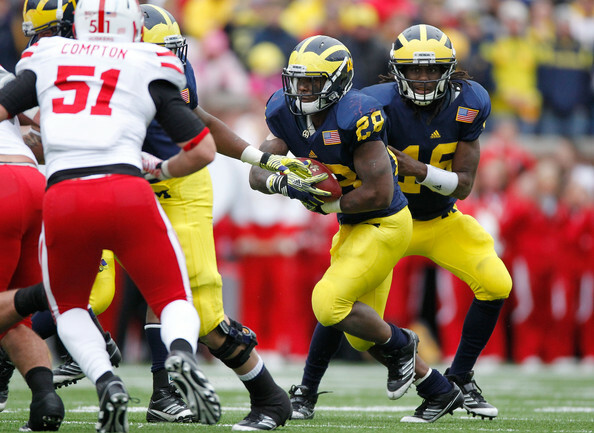 Denard struggled, the running game was non-existant, and the defense was shredded. It's been a while since Michigan was that summarily beaten, but that's what happens when you face the defending national champs and oversigning devotees. With Air Force playing against an FCS team--especially one that was so bad last year (2-9)--last week's game doesn't give us much of an indication of how good the Falcons are. What we do know: they run a traditional 3-4 defense that was pretty soft last year. In 2011, the Falcons ranked 109th in rushing defense, 81st in pass efficiency defense, and 72nd in scoring defense. Air Force is woefully undersized on defense, which dictates much of what they do. Starting nose tackle Cody Miller weighs just 260 pounds and is flanked by defensive ends weighing 240 and 265 pounds each; frequently-used backup nose Nick DeJulion tips the scales at just 240, which Michigan would consider undersized for their weakside DE spot. How will Michigan fare against that kind of a defense? Probably really well. The return of Fitz Toussaint and Not Playing Alabama should help Michigan find its groove on offense. Denard and Toussaint should find lanes, and Michigan's offensive line should look much improved (including Michael Schofield, who struggled against Alabama, but will have a much easier time against the undersized Air Force). If Michigan builds up any kind of sustainable lead (not a guarantee; see: Defense vs. Air Force), this game should be used as an open practice for Denard to get into rhythm with his receivers. Though Alabama was an experience Michigan won't face again, it was clear that Denard and his receivers have a lot of kinks to work out. We need to be careful though: it may be dangerous for the team going forward if Devin Gardner dominates a team like Air Force with shoddy mechanics. If he can't iron out his route-running and blocking issues, his utilization as the #1 receiver this year may be problematic. Before last week, this game seemed like a tune-up on gap responsibilities, assignment football, and tackling. In the wake of the Great Linebacker Implosion of 2012, Air Force's brand of option football looks like a daunting matchup for this defense. This is a triple option offense. The quarterback's first read is usually a dive play to the fullback. (I still have no idea who the quarterback reads here, but he's reading someone.) If the fullback dive has been taken away, the quarterback will pull the ball out and run a traditional pitch option with one of the H-backs (who pulls around the formation). The Navy blog "The Birddog" has a great post breaking down elements of Paul Johnson's flexbone offense. The videos he culls exhibit something I've tried to explain about defending Johnson's offense: you can't just play "assignment football." That term gets thrown around by announcers a lot, with the implication being that all you have to do is "assign" one guy to the dive back, one to the quarterback, and one to the pitch back. 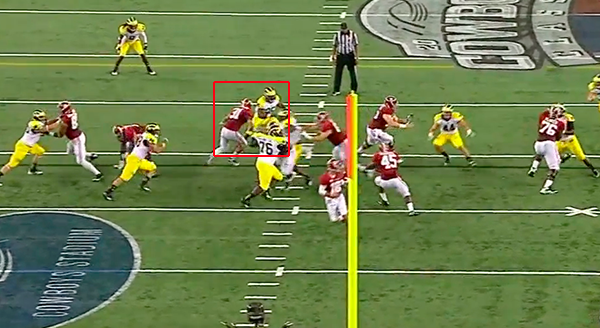 The problem is that Johnson will figure out your assignments and change his blocking schemes accordingly. If Michigan's linebackers weren't indecisive against the run, this would still be a fearsome offense to try to stop. Unfortunately. Defensively, this game will come down to the linebackers properly playing the pitch option, keeping the ball to the inside of the field, and reading and reacting to what the Air Force offense is doing. As for the passing game, this seems like the kind of game that you want following an injury to your second-best cornerback (Blake Countess; Air Force rarely throws the ball more than a dozen times a game), but it's possible to see a less experienced corner getting caught cheating against the run. Though the Falcons' passing game won't intimidate Michigan's defense outright, Courtney Avery and JT Floyd will need to stay disciplined and not overreact to the option running game. How does Michigan win: Michigan's offense shouldn't have any problem moving the ball against an undersized Air Force defense. However, I expect the Air Force offense to put up at least 300 rushing yards against Michigan's suspect second-level defense. If Michigan is going to win this game confidently, they're going to need improved play from the linebacker corps. The defensive line will be able to take away the fullback dive all game, so playing disciplined defense on the edges is really all Michigan needs to do. How does Air Force win: Basically, turnovers and a terrible performance from the linebackers. Denard will have to throw two or three interceptions, and Toussaint will have to put the ball on the ground for Air Force to stop the Michigan offense. On the other side of the ball, Air Force will need to break a few long runs against the defense. Normally doesn't the QB read the player responsible for the FB, normally the playside DE, or whichever player is lined up opposite the play-side tackle? See, e.g., http://www.thekeyplay.com/content/2012/august/30/stopping-triple-option and http://www.americanfootballmonthly.com/Arena/NS_Magazine/Current/clinic01.html. This makes sense. I admittedly haven't done enough reading/film study of the wishbone to really know who the quarterback is reading on any given play. So yes, these links seem logical to me.